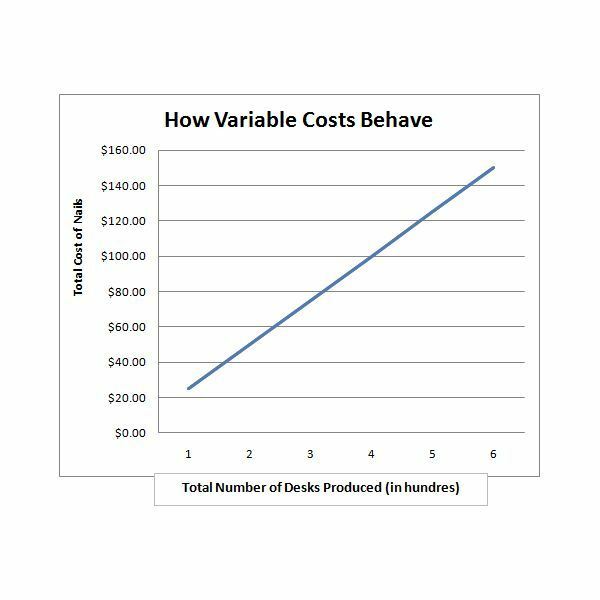 A variable cost is a term used to define costs associated with a project that are dependent on the project’s volume. Let’s use the manufacturing industry to illustrate the point. Further, we’ll invent our own manufacturing company and call it Desks R US. One retailer has just called in an order for 500 cherry wood desks and we need to figure out how much it will cost us to produce those desks. Each desk requires a certain amount of raw materials, in other words screws, nails, cherry wood boards, etc. in order to produce it. This is where variable costs come in. Perhaps each desk unit requires exactly 25 nails. How many nails do we need to purchase in order to complete our order of 500 cherry wood desks? Variable costs include items like nails, screws, glue and wood. Basically, any cost that is dependent on the number of units produced is a variable cost. 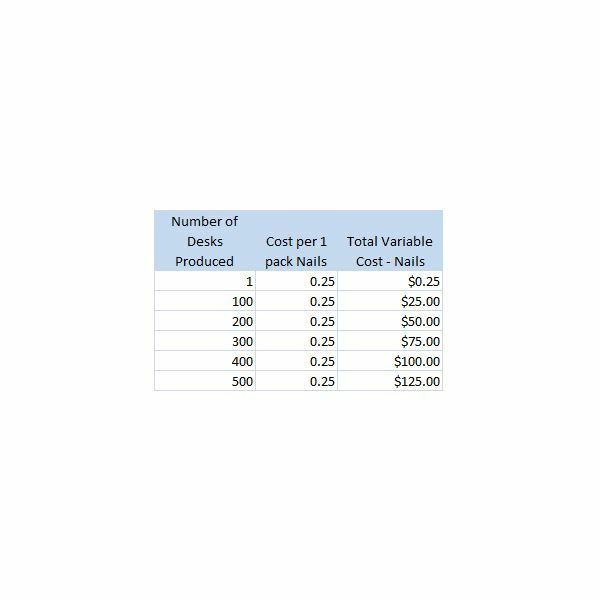 For example, watch how the total dollar amount changes in the following variable costs table as the number of units produced increases. Why is Understanding Variable Costs Important? There are many reasons why understanding how to figure and evaluate variable costs is important. For example, how would a manufacturing company determine the sales price of a product if it doesn’t know how much it costs to produce that product? The answer is simple, it couldn’t. Variable costs are also a great tool for companies to evaluate profitability and review where, if any, costs might be cut. Perhaps our sample company, Desks R US, finds that the cost of nails is 5 cents cheaper at the old hardware store down the road. Imagine the savings. Other examples of variables costs in the manufacturing industry include direct labor needed to produce the product, number of screws or number of boards of wood. 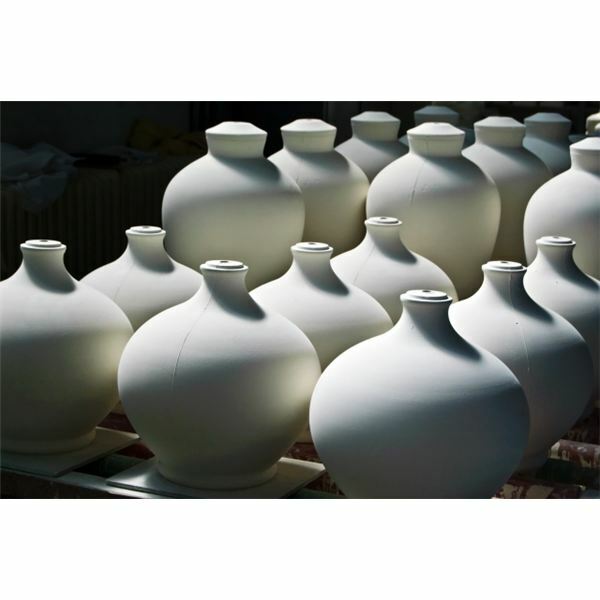 Basically, any raw material used in the production of a product will be a variable cost. Manufacturing overhead such as glue or lubricants can also be considered variable costs. Even sales commissions are a variable cost because the commission is typically calculated based off of percent of the total dollar value of each unit sold. For example, one sales person may earn 10% off the sale of each desk. If one desk retails for $500.00 then the sales person earns $50.00 for every desk sold. See how the amount of commissions paid can vary? This information is vital in order to generate excellent project budgets and profitability forecasts. The manufacturing industry is typically used to explain variable costs because it offers the best illustration in terms of units of production. However, just about any industry from hospitals to retail stores to service providers have variable costs. As an example, a the cost of goods sold line item in a retail store is directly dependent on the number of items the retailer purchases to resell in his store. Further, and accountant may need to purcahse a certain number of company keys for bookkeeping software. This cost would depend on how many clients the accountant currently services.